We’ve collected a few of the most common questions and queries to help you make the most of our collection of mockups! 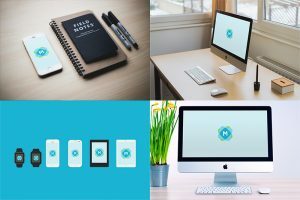 Are all these mockups free to use? Yes – At present, every mockup featured on our site is completely free to use. Some of the designers who created them ask that you attribute them when you use the graphic, but most don’t. They’re a great, free way to showcase your design! What software do I need to use them? Most mockups are provided as PSD files, and require you to have a copy of Adobe Photoshop (version CC or greater usually). There are a few other options for making these files work with other software, but they’re often more complex than they’re worth! How do I put my own design into a mockup? You should then have the perfect mockup for your next project, ready to export or print as you need to. Can I use them for personal and commercial use? Almost every mockup we feature is suitable for both personal and commercial use. Sometimes this can change at a later date, but generally speaking, you’re fine to use them for any time of project. Can I submit my own mockup? Of course! We’d love to consider your mockup for inclusion on the site. Just share the details with us, and we’ll let you know if we choose to feature your item on Mockup Templates.